Vossos Hotel Apartments, Laganas offers guests a convenient location only 100 meters from the beach and a short three minute stroll in to the vibrant town centre with its many bars and shopping opportunities.The large outdoor swimming pool benefits from a well-furnished terrace where holiday makers can relax and enjoy the sun whilst they lounge on comfortable sun beds. 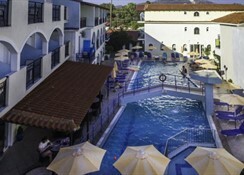 There is a pool bar which offers a variety of snacks and ice cold refreshing drinks throughout the day and evening. Guests can also enjoy a game of billiards on the terrace area. Each of the apartments boasts self-catering facilities and there is a supermarket housed at the entrance area which sells provisions for guestsâ€™ convenience. 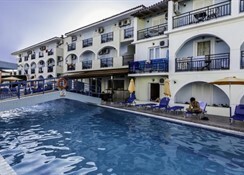 Vossos Hotel Apartments, Laganas is the ideal choice for families and couples seeking a centrally located complex which boasts basic self-catering accommodation, a large swimming pool and dining options. There is a large outdoor swimming pool with an extensive well-furnished terrace offering comfortable sun beds. Each of the 59 apartments have an en-suite bathroom, air-conditioning, fridge, kitchenette, coffee makers and a furnished balcony. Diners can enjoy local and international dishes served in the onsite restaurant and lighter snacks and drinks can be enjoyed at the bar. The apartments benefit from self-catering facilities and guests purchase provisions from the supermarket located at the front gate. 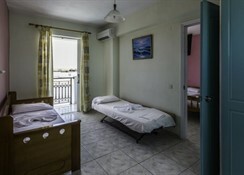 The hotel sits 100 meters from the beach where holiday makers can enjoy number of water sports. The centre of town is three minutesâ€™ walk from the complex with a wealth of bars, shops and restaurants. Guests can enjoy the vibrant nightlife with a variety of nightclubs open all night.